Ken Mansfield can write authoritatively about the music business of the sixties and the Beatles because he was there in the midst of it-making it happen. As a young record label executive at Capitol Records, the Beatles were his clients, and they became his friends. Ken was hand-picked to be the first U.S. Manager of The Beatles' Apple Records and thrust into a world that would change his life forever.?? The Beatles, the Bible and Bodega Bay presents two portraits: the young man in London on top of the Apple building (and on top of the world!) as he watches the Beatles perform for the last time, and the older man on a remote Sonoma beach on his knees looking out to sea and into the heart of his Creator. 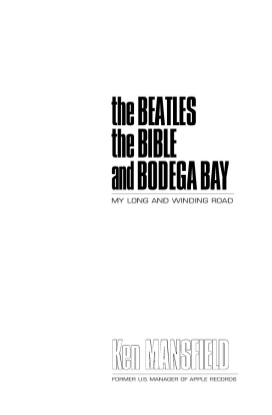 Considered one of the top three best Beatles books of all time, according to the rock editor’s list on Amazon.com. The number-one-selling Beatles book on Amazon.com March 2002. The only book outside of the Beatles Anthology that was approved by the Beatles, their associates, and management.